Vesta meteorites: The images above are photomicrographs of slices from three meteorites confirmed to have originated from the asteroid Vesta. Photographed in transmitted light under crossed polarizers, these images reveal the mineral composition and texture of the meteorites. White scale bars are 2.5 millimeters. Images provided by Harry Y. McSween, The University of Tennessee. 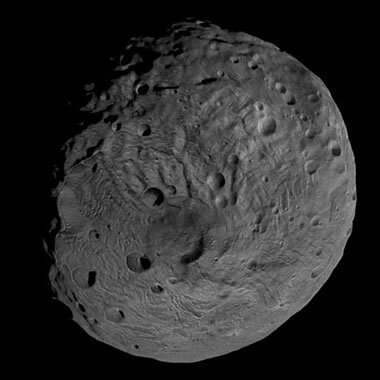 Vesta Asteroid: Vesta, officially named "4 Vesta," is one of the largest asteroids in the solar system. It is about 500 kilometers across (300 miles) and comprises about 9% of the mass of the asteroid belt. NASA's Dawn spacecraft orbited Vesta for about one year between July 2011 and June 2012, collecting data about the mineralogy, chemistry, and isotopic composition of the asteroid. This image views the south polar area of Vesta, showing the Rheasilvia Crater which is about 500 kilometers (300 miles) across. Image by NASA. A meteorite is a rock that was once part of another planet, a moon, or a large asteroid. It was dislodged from its home by a powerful impact event. That impact launched the rock with enough force to escape the gravity of its home body and propel it through space. While it travelled through space it was known as a "meteoroid." Eventually, perhaps billions of years later, the meteoroid was captured by Earth's gravitational field, and it fell through Earth's atmosphere to the ground. Although meteorites are extremely rare, thousands of them have been found on Earth's surface. Over 99% of all meteorites found on Earth are thought to be pieces of asteroids. A few of the meteorites found on Earth have been attributed to specific solar system bodies. 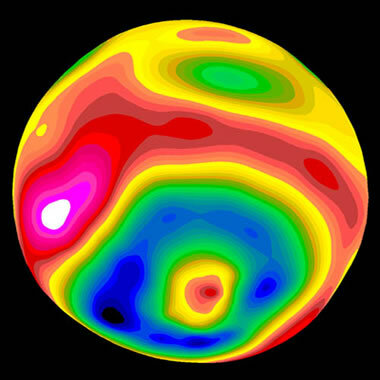 Vesta asteroid topography: Color topographic map of Vesta asteroid viewing the south polar area. Deep blue areas are topographic lows. Topographic highs are red through pink to white. This view shows the giant Rheasilvia Crater in the southern hemisphere with a high central peak. Image by NASA. Researchers have learned a lot about the chemistry, mineralogy, and isotopic composition of rocks from the Moon by studying specimens brought back to Earth by NASA's lunar missions. The characteristics of rocks on Mars have been determined through analyses done by rovers and other equipment sent to that planet. By comparing the composition of meteorites to this data, researchers have been able to identify meteorites that are probably pieces of Moon and Mars. While orbiting Vesta, NASA's Dawn spacecraft has scanned the surface of the asteroid, collecting data about its chemical and mineralogical composition. This information has confirmed that HED meteorites, a subgroup of stony achondrite meteorites, are pieces of Vesta that have fallen to Earth. The colorful images at the top of this page are photomicrographs of slices of HED meteorites from Vesta taken in plane polarized light under crossed polarizers. Photomicrographs of three Vesta meteorites shown in greater detail at the top of this page. Images by Harry McSween, University of Tennessee. HED meteorites are achondrites (stony meteorites that do not contain chondrules) that are similar to terrestrial igneous rocks. They are thought to have originated from Vesta. There are three subgroups: Howardites, Eucrites, and Diogenites. These differ in mineral composition and texture, which were determined by their history while still part of the crust of Vesta. Howardites are regolith breccias made up of eucrite, diogenite, and some carbonaceous chondrules. They are believed to have formed on the surface of Vesta from impact ejecta which was buried by later impact debris and lithified. There are no known terrestrial equivalents to this type of rock. Basaltic Eucrites are rocks from the crust of Vesta that are composed mainly of Ca-poor pyroxene, pigeonite, and Ca-rich plagioclase. Cumulate eucrites have a similar composition to basaltic eucrites; however, they have oriented crystals and are thought to be intrusive rocks, crystallized in shallow plutons within Vesta's crust. Diogenites are believed to have crystallized in deep plutons within Vesta's crust. They have a much coarser texture than eucrites and are composed mainly of Mg-rich orthopyroxene, plagioclase, and olivine. Meteorwritings: A series of articles about meteorites authored by Geoffrey Notkin of Aerolite Meteorites and published by Geology.com in 2008 through 2010. Lunar Meteorites: Department of Earth and Planetary Sciences, Washington University in St. Louis, last accessed December 2016. Martian Meteorites: International Meteorite Collectors Association, last accessed December 2016. Dawn's Targets - Vesta and Ceres: Article in the Dawn Missions section of the NASA website, last accessed December 2016. Extralunar Materials in Lunar Regolith: A White Paper Submitted for the NRC Decadal Survey by Marc Fries, John Armstrong, James Ashley, Luther Beegle, Timothy Jull, and Glenn Sellar. Lunar and Planetary Institute, last accessed December 2016. The most prominent feature on the surface of Vesta is an enormous crater near the south pole. The Rheasilvia Crater is about 500 kilometers in diameter (300 miles). The floor of the crater is about 13 kilometers (8 miles) below the undisturbed surface of Vesta and its rim, a combination of upturned strata and ejecta, rises between 4 and 12 kilometers (2.5 and 7.5 miles) above the surface of the undisturbed surface of Vesta. This crater is thought to have formed by an enormous impact with another asteroid about one billion years ago. Meteorites beyond Earth have been found by NASA space missions. At least three lunar-resident meteorites have been found by NASA moon landings. In addition, trace element evidence of extralunar materials has been found in lunar regolith samples. NASA's Mars Rovers have encountered and photographed several impressive meteorites on the surface of Mars.